I have a small foot but it is wide with a high instep. So I have tried some modifications to the foot pockets that have worked very well to increase the comfort of my Dolphin Tail. 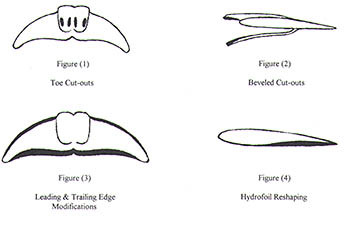 Figure (1) shows how I cut holes where both my little and big toes were against the sides. Figure (2) shows how I eased the pressure on my instep by cutting away material at the top entry point of the foot pockets. Notice that I also beveled away some material at the bottom entry surface. These two modifications greatly increase foot size accommodation. I now can wear two pair of toe boots and still advance my size eights deeper into the foot pockets. This makes my very easy-to-swim-with fin even easier to swim with. In addition I have taken considerably more material out of the fin to test performance modifications. Figure (3) shows two of these, the one the blunting of the flukes leading edge, and the other the cutting back of the trailing edge. These changes had a very noticeable reduction of the fin’s weight and even a possible increase in the monofins performance. Since the fin was now even more easy to pump, it seemed much had been gained. Figure (4) shows still another modification. This was to the hydrofoil shape of the underside of the fin. This change involved removing a lot of material, further easing fin pumping to the extent that a more rapid motion could be felt when sprinting with the fin. The most dramatic effect for me was the improved flow of the water over the fin which seemed to make the fin more efficient. The sum total effect of these mods was a feeling that the fin had become more flexible and therefore even more efficient in its propulsion of the water rearward. So there are many opportunities for a dolphin tail owner to experiment with the fin and discover what enhances performance. Note: Dark areas show where rubber has been removed. I used an Exacto knife and sanding attachments to a hand drill. I hope to sponsor some competitions soon, so stay in touch.